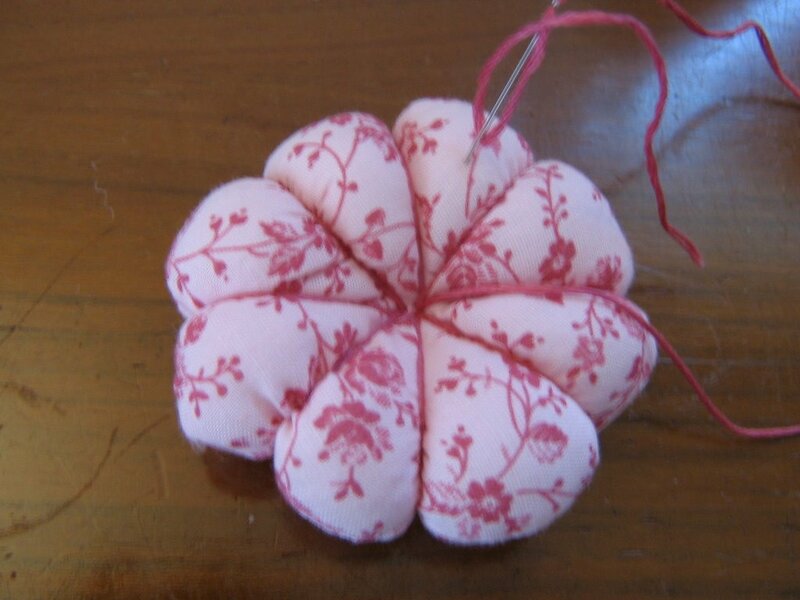 I have seen these flower pin cushions on quite a few blogs, so the idea is not new to me. They are so fun and easy to make! I made mine this afternoon. 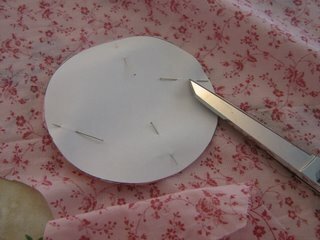 Draw a circle pattern (I used a 4" circle, which made a small pin cushion). Turn, stuff, and sew opening shut. Sew a button in the middle. All done! *If you zig zag around the seam, there is no need to clip the edge. This same little trick works wonders with collars, neck edges, and anything that is curved. 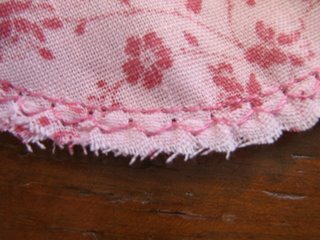 Simply stitch, zig zag close to seam, and then trim close to zig zag edge. That is cute and a half. It looks simple enough for even me!! Since I do not possess a sewing machine....does that zig zag trick work if you're doing it by hand? That is probably a stupid question, but that's about my speed when it comes to needles and thread. Anne, I don't think I would attempt to sew zig zag by hand. 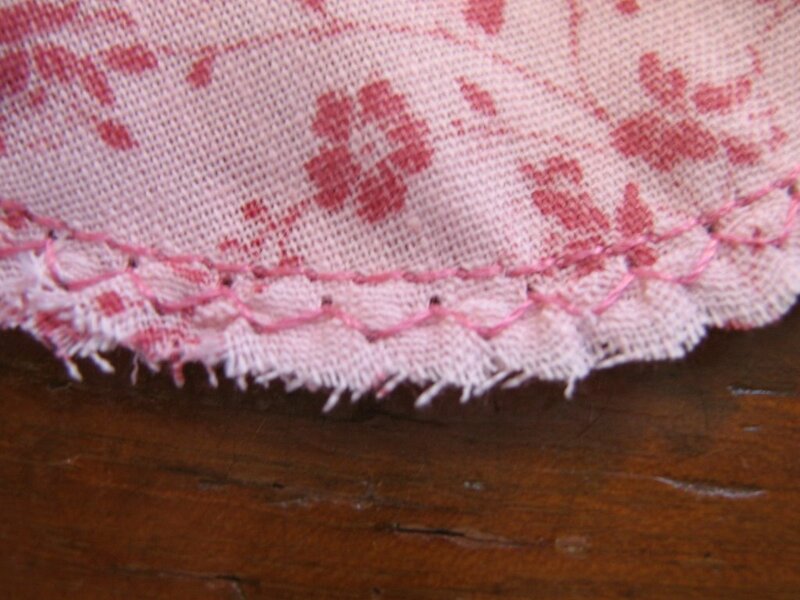 If I were sewing it by hand, I would stitch tiny stitches close together, and then clip it, but not quite to the seam. Very cute!! My daughter and I will have to make one. Thanks for sharing. You did a lovely job - I love the fabric you chose for this. Hmmmmm... easier said than done. I can't even sew a straight line!!! (something I want to learn before we bring our baby home!!!). It is ABSOLUTELY adorable!!!! I really like your blog, Tammy! Oh, goodie! A project I think I can do! Did you just stuff it with Fiber Fill???? I think I might do this for gifts for our ladies tea at church. Lela, yes, I stuffed it with fiberfill. how sweet! and thanks for the zigzag tip. Thanks for this idea Tammy. I've just started sewing with my four daughters. We come to you sight often looking for ideas. We are very excited about the flower. I've just translate in French and I'll put it on my blog tomorrow in the afternoon !!! Great! Thanks for this tutorial! Great idea. I can make several and attach to packages as little extras!! Also, as I kept looking at the photos, I could picture it as an orange pumpkin. Might just have to try that one, too. Thanks for the instructions. Hi Tammy, This pincushion is so cute. I am telling my friends about your blog. Thank you for posting it. Such a cute little pin cushion! How do you attach the embroidery floss on the underside? Thanks! Thank you for this adorable pattern. My best friend loves red so I made her a flower pin-cushion from beige fabric with tiny red stars on it, red embroidery floss, and even found a small red star button. It turned out great and she was thrilled with it. I plan to make many more for family and friends. Thanks for the inspiration. Oh thank you - I have been looking for a pincushion pattern that I can manage (rather amateur seamstress, me) and I think this may be the one! So simple yet so stunning. The pin cushion is beautiful! I am going to make one. Thanks for the tutorial. Tammy, the pincushion is VERY CUTE! THANKS for sharing, it is so darling. 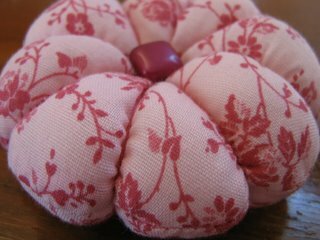 Tammy, Thanks so much for sharing how to make this adorable pin cushion! I've been wondering they were made. This is great and very easy for a newbie like me to follow i plan on making this soon. i love the pin cushion. Such a helpful tutorial! Thanks Tammy! The seam allowance is 1/4". Thank you for posting this great tutorial! It will come in handy! Thank you so much for the cut pincushion idea, seems that at age 52 i am just waking up and really having fun learning new crafts and hobbies and enjoying the girl times. Going to make this with my 11 year old granddaughter. thanks so much! Timeless piece ! I just made one and love it. Thank you so much for sharing this with all of us. Thanks for all the lovely comments! Happy sewing! Ooh!! Thanks! I've ALWAYS wanted to know how to do this! What did you use to stuff your pincushion? Thanks! I want to know what fabric did you use for the pincushion. I just begin my sewing classes and I like to make one like that, It's so cute! I just used a scrap that I had in my fabric bin, it was something I'd had for quite a few years. Any tips on how to sew the hole shut after stuffing tightly? I would like to try one, but need to know how you did that? Thank you for sharing...I am excited about trying one. Thank you for all of your help, Tammy...you are a blessing! This is cute as can be. Any tips for sewing on the button since there isn't access to the back side? To sew the button on, you do want to go through the whole pin cushion - it helps the button stay firmly in place. You can hide the knot by starting the needle where the button will be sewn. 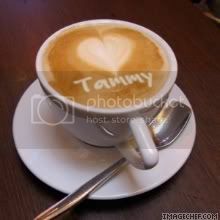 Tammy, I love your blogg! Thank you for the pin cushion,I made it yesterday and it turned out so cute! Am a daughter of the King of Kings and Lord of Lords too! Thanks for the post, have been looking for a very simple pin cushion to make with my daughter - this is just right! thanks for sharing. What a great idea! Thanks for osting this tutorial. One question though: how do you keep the point on the bottom where all the embroidery floss crosses (in the center of the bottom) perfect like that? As you're stitching with the embroidery thread, you are bringing your needle up through the same spot each time. It goes UP from the bottom, wrap the thread from the top to the bottom and then go UP again. Thank you so much for stopping by! I am a daughter of the King, wife to Kevin for 15 years, and mama to my precious six-year old daughter and a wee baby in Heaven. I love to cook, read, crochet, knit, sew, and pursue other crafts as I become interested in them! This blog is my outlet to share about my interests. Guess who I just saw? From my Mother's Heart: That's not a Bible verse? My hummingbird feeder is up!